Imagine a community where healthy food marketing is the norm: Billboards, signs, and bus advertisements promote water rather than sugary drinks, and TV, radio, and internet ads publicize local deals on fresh produce. Child care settings and schools follow nutrition standards and are free of junk food marketing, and government vending machines provide healthy snacks. Restaurants and stores have no advertising in their windows, and they discount healthy items and offer nutritious children’s meals. In reality, unhealthy marketing is disturbingly pervasive, and often targets youth. Young children are particularly impressionable, and these marketing tactics lead kids to nag their parents or caregivers until they buy unhealthy foods. Kids can then develop a preference for foods that are bad for them – a preference that can last a lifetime. For that reason, policymakers, community organizations, and parents may want to address unhealthy marketing to children, but may not know where to begin. ChangeLab Solutions, through a contract with the Los Angeles County Department of Public Health and funding from First 5 Los Angeles, developed Marketing Matters: A White Paper on Strategies to Reduce Unhealthy Food Marketing to Young Children to help local jurisdictions understand how they can regulate the marketing of unhealthy foods and beverages to kids, particularly those under age five. The executive summary explains the importance of regulating marketing to kids, describes unhealthy marketing practices and their effects, and outlines the different policy options. 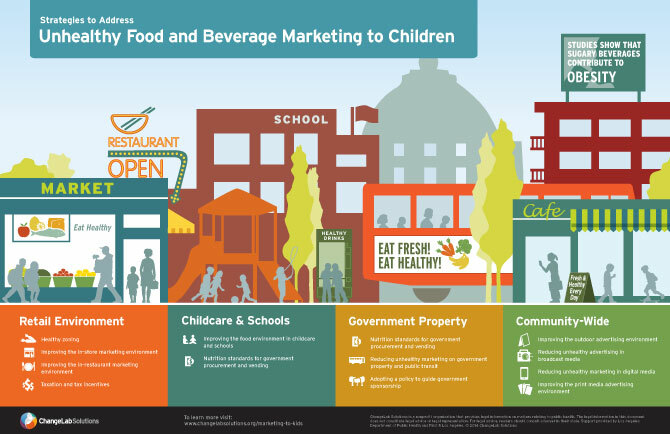 The complete report equips jurisdictions with the data and tools necessary to combat the marketing of unhealthy foods and beverages to young children. It provides a detailed legal analysis of the options available, and discusses strategies communities can use to reduce unhealthy marketing. This infographic outlines where and how marketing can be regulated in a community. The toolkit also includes a series of practical guides, in both Spanish and English, for community groups, parents, and policymakers. To learn more about related policy strategies, take a look at our resources on restricting food marketing and creating healthier food environments. To limit other advertising in your jurisdiction, check out our materials on regulating tobacco marketing and reducing storefront signage. Contact ChangeLab Solutions for help reducing unhealthy marketing in your community.